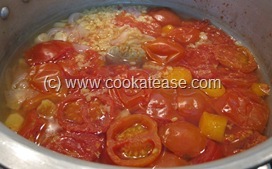 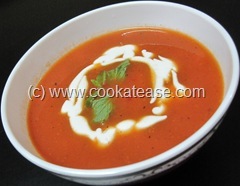 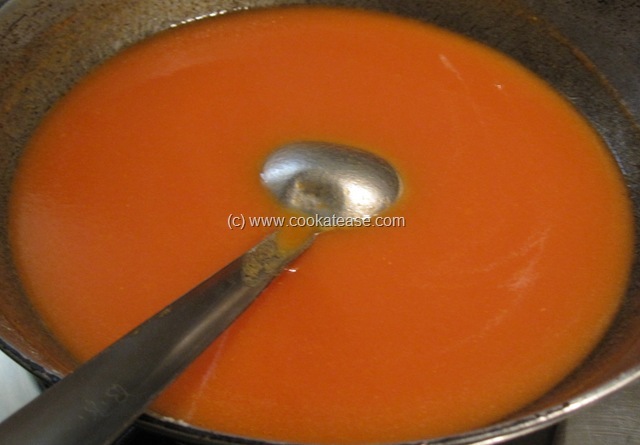 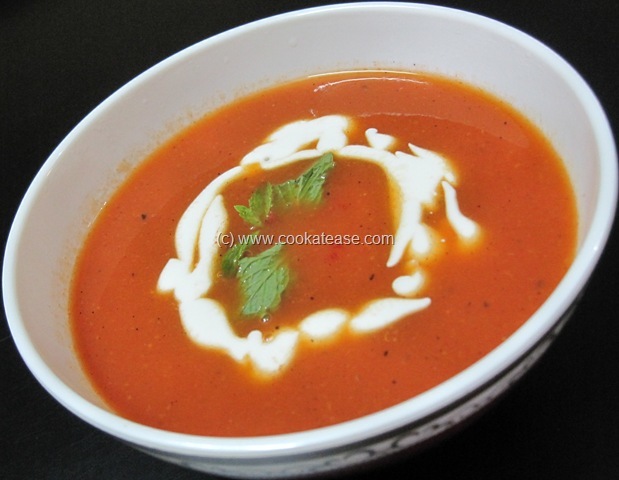 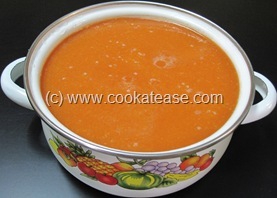 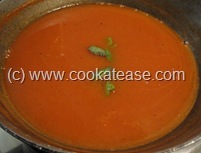 Tomato Soup is a popular soup among soup lovers. It is prepared by using different spices, herbs with slight variations. In this soup, I added little green gram to thicken soup and to improve the taste and nutritive value. 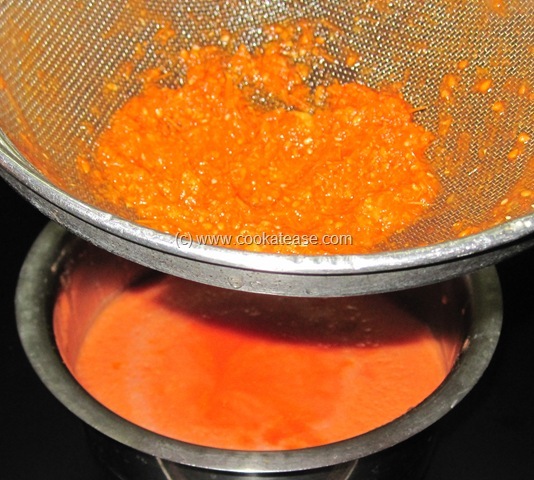 Also I used spices by tying them in a clean cloth while boiling and removed it later. 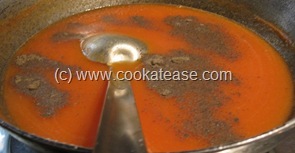 This gives mild flavor to the soup. I used cream to garnish soup without using milk in the soup. 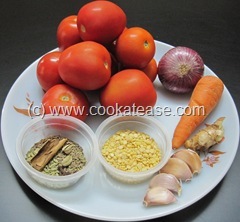 Tomato is known as Thakkali in Tamil and as Tomatar in Hindi. For the given quantity of ingredients, I got 8 to 10 cups of soup. Chop onion, garlic, ginger, carrot and tomato; in a cooker add chopped tomato, ginger, garlic, carrot and onion; add washed green gram, 2 cups of water, spices (tied in a cloth); cook for two whistles and allow it to cool; remove the cloth tied with spices (hereafter it is not needed). 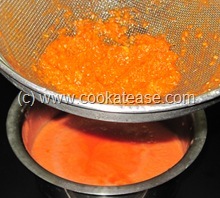 Blend it lightly in a mixer; filter and keep the pulp. In a pan add butter, corn flour and mix; cook in low flame for few seconds; add ½ cup water, mix briskly; cook for a minute; add vegetable stock, ground tomato pulp and mix it; adjust water consistency as per your need. 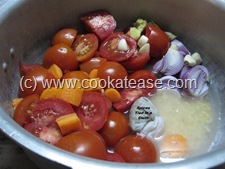 Add salt, pepper and sugar; remove just before boiling state; add mint leaves. 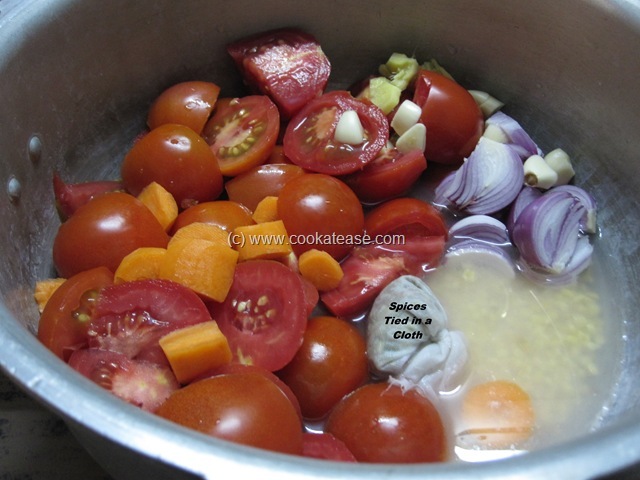 Combination of oval and round shaped tomatoes help to balance sour taste (round ones have thin skin with more juice and sour; oval ones have thick skin, less juice and slightly sweet). 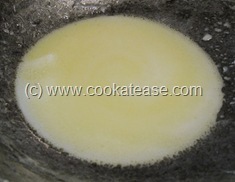 Sugar also helps to balance the taste. Remove the soup from flame just before boiling point to get creamy texture in soup. 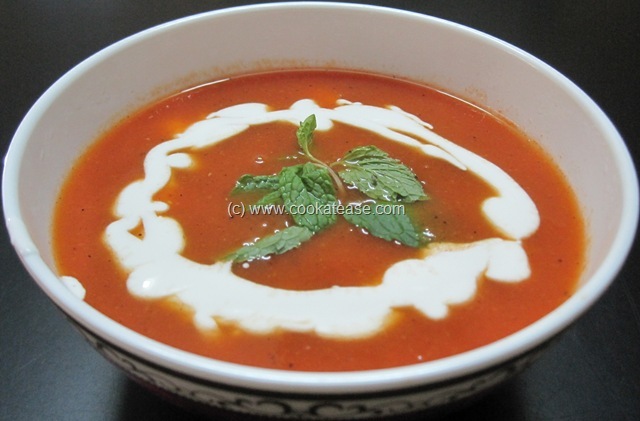 Beautiful and healthy soup….even i do this once in a while..